For the past few weeks we’ve been caring for another life our house. It all started on Monday a few weeks ago. My son brought home his harvest from his children’s garden at the Arboretum. As he was showing me all the vegetables and flowers he’d harvested, he spotted a caterpillar. It was crawling on one piece of the vast amounts of dill he’d brought home. How he spotted it, I’ll never know. We decided to keep it. 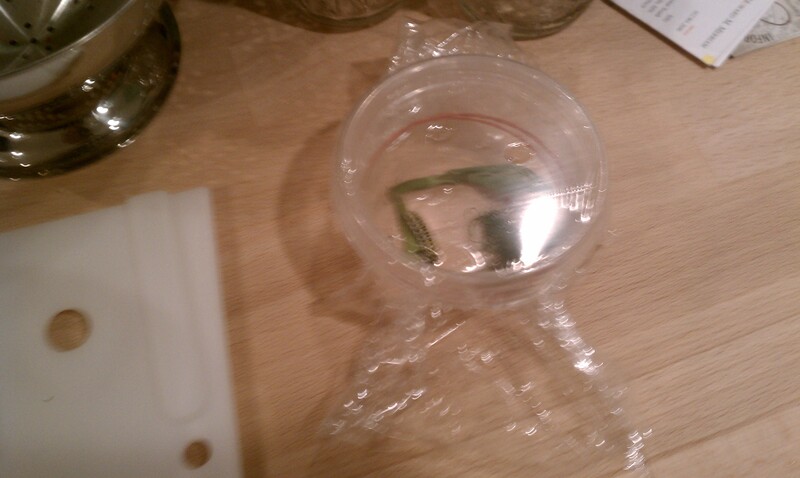 We transferred the caterpillar, along with a few pieces of dill, into a little cup. He covered the cup with plastic and poked a few air holes in it. We continued feeding it fresh dill and cleaning its home daily (we learned caterpillars poop a lot) and literally watched it grow before our eyes. 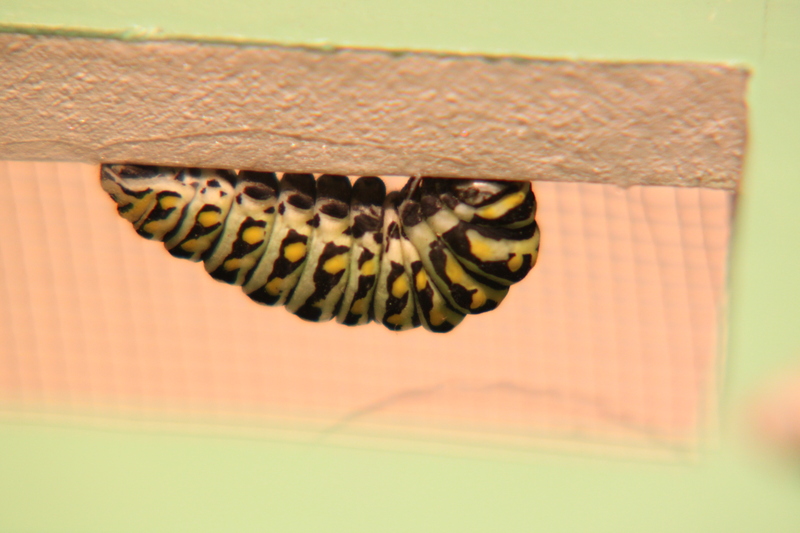 Having never kept a caterpillar for more than a couple of days, we found the entire transformation absolutely fascinating. At first it was pretty small and didn’t have a lot of color, but after shedding a couple of layers of skin its color became more and more vivid. It’s black body had cream-colored spots and bright green stripes. After less than a week the caterpillar outgrew its little cup so we transferred it to a butterfly/bug box my son had gotten when he was younger. In its new home the caterpillar continued to dine on its daily buffet of fresh dill until one day, about a week ago, it just stopped. It stopped eating, it stopped moving. It scrunched itself up and only moved if we (unintentionally) startled it and at that, it would only flinch. 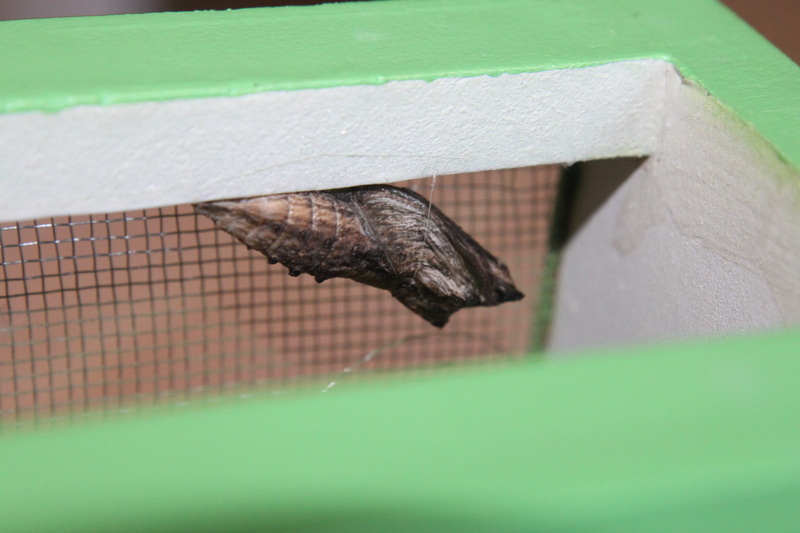 After a day or so, it formed its cocoon/chrysalis and there it stayed, attached to the upper part of the butterfly box, for at least another week. This morning, as I was reaching for a cup of coffee, my son screamed. I jumped, my coffee starting doing acrobatics in the air and amazingly enough, every drop landed back in my cup. When I turned to see what he was screaming about, he was pointing to the butterfly box, shouting “Mom, look! Look! I knew it! I knew it would be a butterfly!” And so it was. Black, light spots, trademark tail. We’d guessed right. 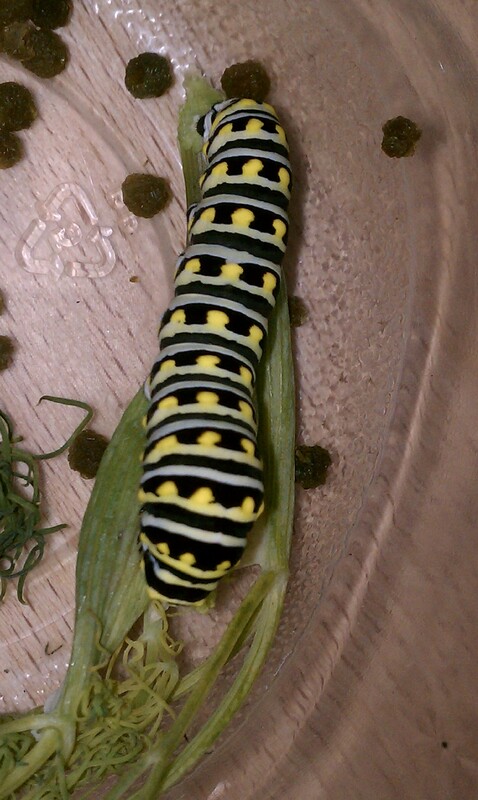 Our caterpillar was a swallowtail. At first he was disappointed. “Mom, it doesn’t have the blue like we thought it would.” We’d spent a little time, looking at pictures of swallowtail caterpillars and butterflies on the web, so he had in his mind what it would look like. It wasn’t there, yet. I reminded him that it takes a little while for the color to fully develop on their wings. 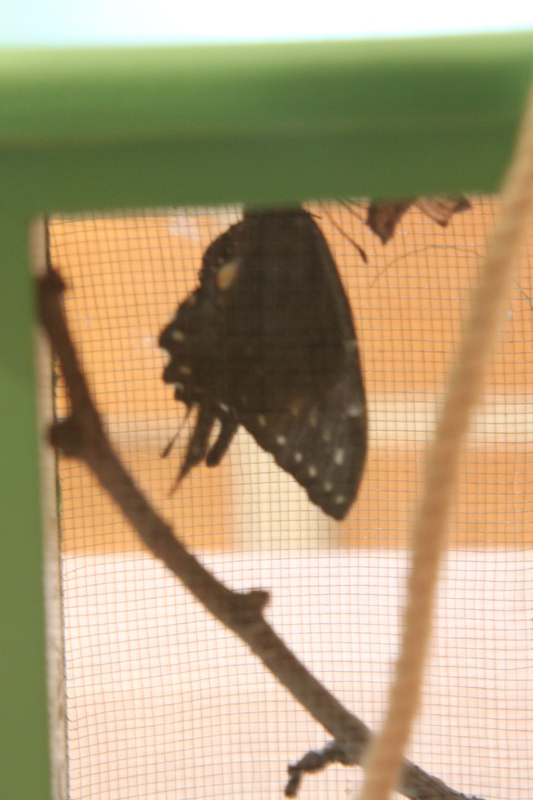 After admiring our butterfly in the kitchen for a little bit, we decided it was time to release “him” (we found out later “he” was actually a “she). So, outside we went, searching for a good spot. We tried a little zinnia my son had grown from seed but it seemed a little too small. We then contemplated between milkweed and a few other flowers. At last my son decided on the phlox. We gently transferred him, then headed inside to finish “getting ready”. About an hour later I thought I’d check up on our butterfly and see if he’d flown away yet. I peeked out the window but couldn’t see him. I decided to go out and look. 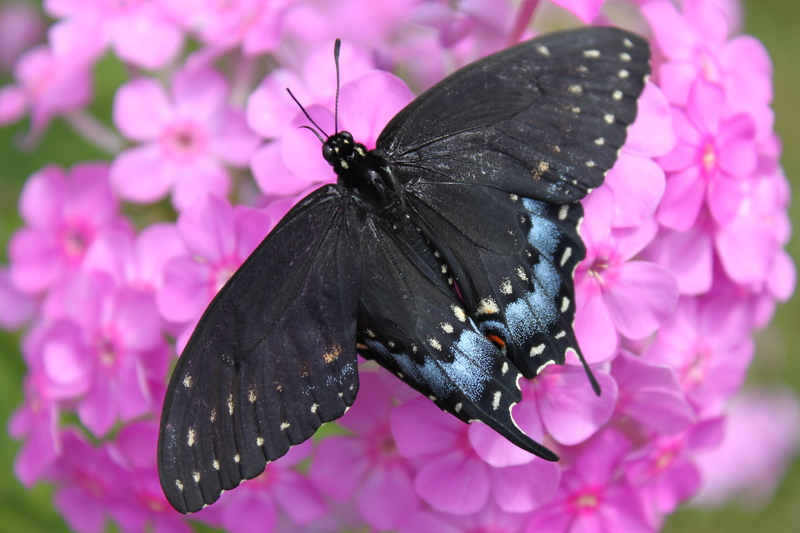 I found him, not on the phlox, but on the ground fluttering around. My heart sunk. Oh, no! I’d seen the neighbors cat in our yard earlier, I was fearing our butterfly had been used as a kitty toy. I gently eased him onto my finger. He appeared to be untouched. I tried to transfer him onto some plants but he didn’t want to go. He kept turning around and walking up my finger and onto my hand. Finally, I transferred him. This time to one of the milkweed leaves. Periodically I would look out the window and see him, still clinging to the milkweed. Later, I peeked out again and didn’t see him. Again, I went out to find him on the ground. Crap! Did we do something wrong? Did his wings not grow properly? What happened? I eased him onto my finger again, checking him over. Everything looked okay. The body of the butterfly was shaking, it had been all morning. My son had noticed the shaking early in the morning and asked me why it was doing that. I had no idea, I’d assumed it was like a colt standing on shaky legs for the first time. Maybe he needed nectar? A little sugar to give him the energy to fly. I set him on the phlox again where his tongue could easily reach for food. He didn’t eat. I got distracted (as I often do). I saw a bee in another phlox and since I just happened to have my camera on me, I started taking pictures. When I turned back, the butterfly was gone. I searched the ground fearing I’d bumped him and knocked him off the flower inadvertently. He was nowhere to be found. That’s good, right? He was gone. He must have flown away. Good for him. Sort of. I have to admit, as silly as it sounds, I was a little disappointed that I didn’t get to see him take off. It felt kind of like your child leaving without saying goodbye. I know, I know… It’s just a butterfly. But still. Since the weather is so beautiful this week, I’ve been trying to take advantage of it and get outside as much as possible. I decided to have my lunch outside today (in hopes I might see our butterfly again). It just so happened that as I was just about to sit down, out of the corner of my eye, I saw fluttering! 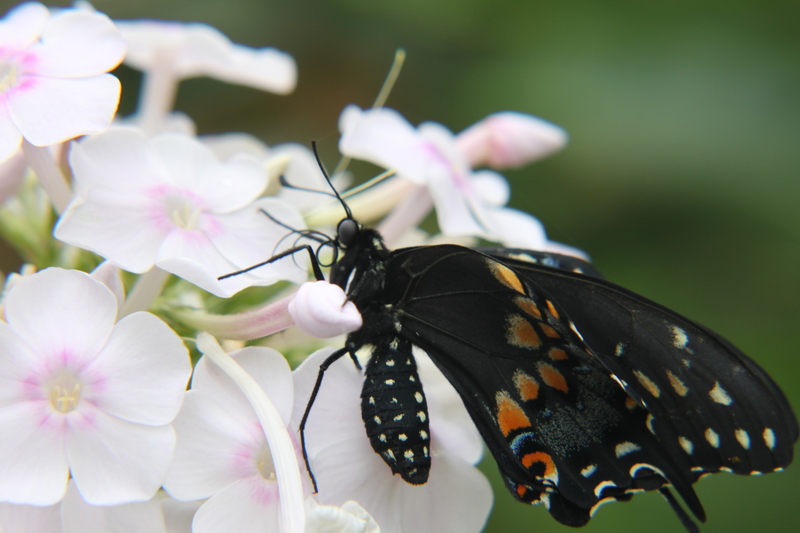 I glanced up to see our butterfly – black with beautiful blue and splashes of orange. 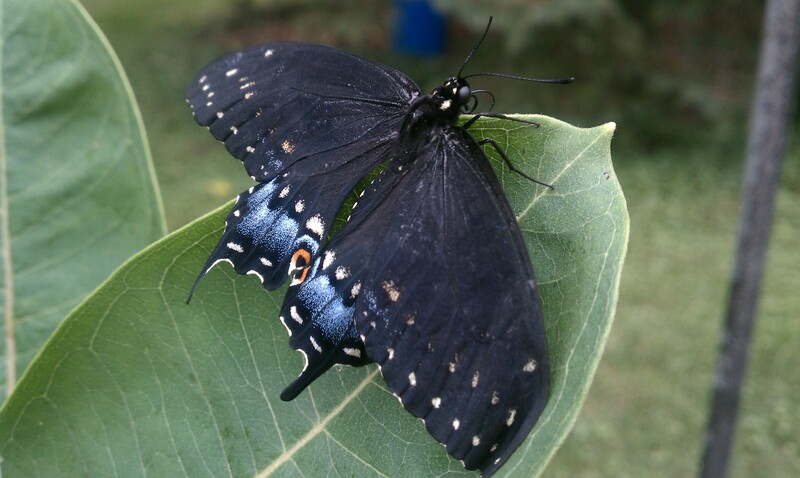 He fluttered by, sat on my son’s zinnia just for a minute, flapped his wings, then was gone. That’s what I needed. I just wanted to know that he was okay. I smiled. A proud mom… of a butterfly.